Njoki is currently pursuing her PhD in law at the University of Nairobi, in the area of maritime law. Njoki is also a research associate with SAFESEAS, a pilot project that studies lessons from maritime security capacity building in the Western Indian Ocean. Her primary role is to contribute to mapping national maritime security sectors through case studies of MSSR processes in Kenya. Njoki is one of the drivers of the implementation of the FishFORCE Academy model in Kenya, as the University of Nairobi’s liaison person with the FishFORCE Academy which is centred at Nelson Mandela Metropolitan University, Port Elizabeth South Africa (NMMU).The initiative seeks to set up an Institute of Ocean Sciences and Governance in Kenya and the suitability of the FishFORCE model in Kenya for purposes of combating maritime crime. Njoki is a lawyer by profession and an advocate of the High court of Kenya, where her legal practice is situated. 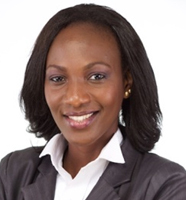 She is also a certified civil and commercial mediator by the ADRg Group and qualified for Associate membership with the Chartered Institute of Arbitrators (Kenya). Njoki also trains on trial advocacy with Justice Advocacy Africa, a non-profit organization which facilitates trial advocacy training programs in Africa. She holds a Master of Laws (LL.M), specializing in international trade and investments. Her fields of research interest are International Trade and Investments, Maritime Governance, Alternative Dispute Resolution and Administrative Law, Democracy & Governance. Rule of law, Economic development and Investment Arbitration under Bilateral Investment Treaties (BITS). (2016) 4(1) Alternative Dispute Resolution (ISBN 978-9966-046-09-3), the Chartered Institute of Arbitrators –Kenya Journal. Enforcement of International Arbitral Awards: Public Policy Limitation. (2015) 3(1) Alternative Dispute Resolution (ISBN 978-9966-046-04-8), the Chartered Institute of Arbitrators –Kenya Journal. Kenya: From Sea-blind to ‘Sea-vision’- Maritime Security Sector Reform in Kenya (draft under review, co-authored with Dr. Robert Mccabe under the SAFESEAS project.